Tax Preparation - Let Us Help You With Your Tax Preparation. Call Now | Joseph Falco Accounting Services, Inc. Preparing your personal or business income tax return can seem like a simple, self-explanatory task; but truthfully, preparing tax returns is a complicated procedure which is best suited for professional, experienced CPAs. In fact, a study released by the US Government’s General Accounting Office indicates that 77-percent of taxpayers believe they would benefit from using a professional tax preparer — we couldn’t agree more. As our tax laws are revised they become more and more complicated. Even if you’ve prepared your personal or business tax returns by yourself in the past, the changes made each year can cause errors in your return, resulting in messy, time-consuming audits. Modern tax return computer software can be helpful in preparing your return on your own, but nothing can replace the valuable assistance of an experienced, personable professional. Let Joseph Falco Accounting prepare your personal or business tax return and you can take complete comfort in knowing that your return is being filed accurately and on time. Joseph Falco files your taxes electronically to expedite the process and offer you the option to receive your return as an ACH transfer to your bank or in the form of a paper check. We will also provide the expert advice on potential deductions and show you how to limit your tax liability in the future. When it comes to tax preparation, remember that we work to let you keep as much of your income as possible and pay only the necessary amount of taxes. Let us ensure that you’re keeping as much of your hard-earned income as possible. If you’re a business owner, let us show you how you can reserve more of your monthly and quarterly revenue and pay fewer unnecessary taxes to the government. We’ll also prepare a full Schedule C and help you setup bookkeeping for the next year. 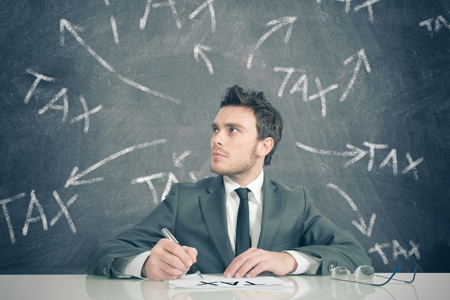 Our tax preparation services are invaluable to small businesses who carry a large tax liability. Let us help you keep more of your revenue—contact us today for a free consultation.